It seems, so far, I have found plenty of other things to do this winter, and it was a relief to get back to thinking about jewelry today. 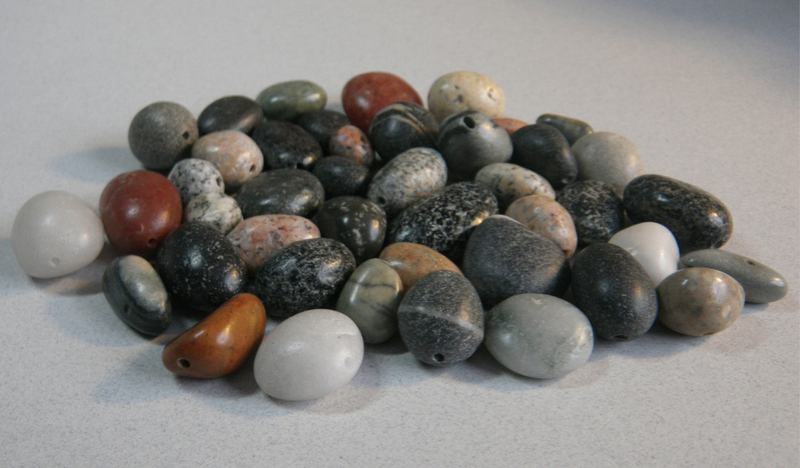 I have an abundance of things to inspire me, like components I have purchased from other artists on Etsy, that I plan to combine with my own handmade silver beads. 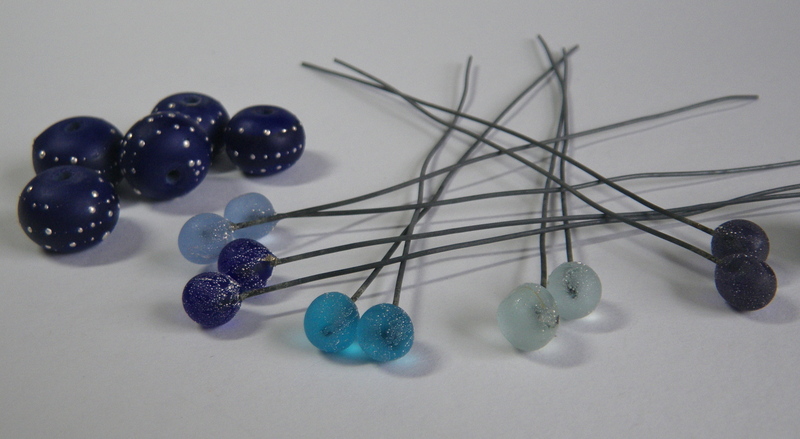 I am pretty excited about these glass headpins from SueBeads and the dark blue glass beads made by Dreamscapes Studio. I love all the colors in the components below. 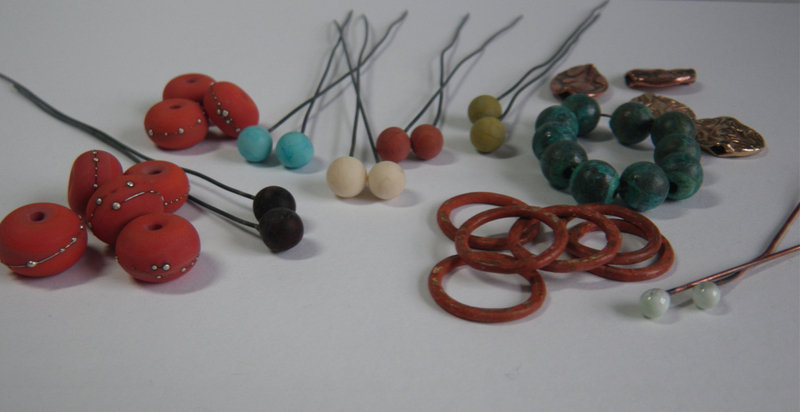 Again some glass headpins, and some red glass beads from Suebeads, the patina-ted copper links and copper beads from Miss Ficklemedia, and way in the back are a few of my own copper and bronze beads, reminding me to find my bronze and copper clay and get to work making more of those. 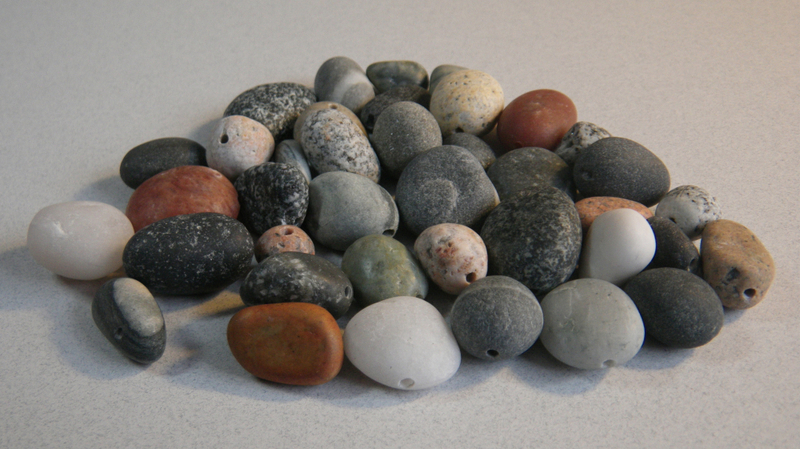 I have also drilled some local beach stones, and they are ready to go for some new necklaces. It’s time for me to begin my 9 a.m. to 1 p.m. routine of uninterrupted studio time. I find if I avoid answering the phone, or starting any house work, and simply stay in the studio for 4 hours straight, I can be pretty productive and usually continue my studio time into the afternoon. I don’t understand why I have such a hard time disciplining myself to make time for something I love to do. Having a set schedule and telling people I am unavailable for those four hours helps me believe that’s what I deserve to be doing. If you work from your home, how do you make the time to do it? How do you keep from becoming distracted and drawn away by the day to day maintenance of your home, community, kids, etc? I’d love to know. Please leave a comment! I try to do the same thing you do…go straight from bed or breakfast to whatever creative thing I have decided to do that day and stick with it ’til 12 or 1. If I so much as even check my e-mail before or during that time I am liable to sink myself for the day! This morning I got some scrapbook pages done between about 7 and 11. Not as long as usual, but long enough for today! I have laid out the ones I want to do later today or tomorrow too and I feel good about that. All those Christmas card pictures are finding a home. I did lose about 20 minutes this morning right off when I couldn’t find some new paper I just received…organize, organize, organize!!! Sometimes I organize myself into a panic! Oh, I know what you mean about losing time looking for something that should be right there. I hate that! And it seems like it happens all too often. But what a reminder you gave me. Don’t organize myself into a panic! Hey Susan, it’s Sunday night and we don’t have to write a column! I panicked for a second this afternoon. I had been working at the old desktop computer, got ready to go for a walk w/ Bruce and thought for a split second, “Oh no. I have to write the column…” Then I remembered. It sounds like you go a lot doine this morning. Where does one buy butchers wax? I know it’s not that relevant…I work at night only and find that if I HAVE to walk away I leave the light on and that light in the dark house pulls me back…. I leave the light on too. Hoping it will pull me back after dinner. Then Bruce turns it off and sometimes it’s enough to keep me from going back….so, I think it works! I love the look of wax on the stones. Really enhances the colors and patterns. And beautiful materials to help you get inspired! As far as getting to the studio…I agree sometimes it seems to be a bit of a challenge. Life, and all of its distractions, seem to often get in the way but once I’m there, I LOVE it. I turn on CBC…our version of Canadian public radio, listen to my favorite programs or music…and am so grateful to have some time to “play”. I think that sometimes I get overwhelmed with all the ideas I want to try…or the fear that I ‘ll be disappointed in what I make, or the reality that sometimes I won’t be able to find what I need (organization is always a work- in- progress)…but in the end…it’s always a learning experience and a wonderful opportunity to get lost in the magical world of creating. I find, too, that if I set aside a specific time during the week, it helps to get me out there. My time is 1:00 to 4:00 in the afternoon…and then sometimes I wonder how it got to be 6:00! Happy creating! It is so helpful to hear how people get to work. If Bruce is away I will work through dinner and eat a bowl of cereal around 9 p.m. I love to be able to work open ended like that, but it doesn’t happen very often. Thanks for the comment on the rocks. I know that you and Angie work with them a lot too. I found that they darken in color anyway from picking up oil from the skin, so I started to use the wax to give them a more even darkening. It was one of those things I wasn’t sure would work, and it turned out okay. No matter how we do it, we’re all so lucky to find the time to create.